Raffles Design Institute Manila together with Hanabana Publishing cordially invites you to come and join in "DESIGN EXPLORATION - Homage Pavilions as Experiential Memorials," a primer on the lecture, exhibition and E-Book launching of Arch. Fredinel Banaag. 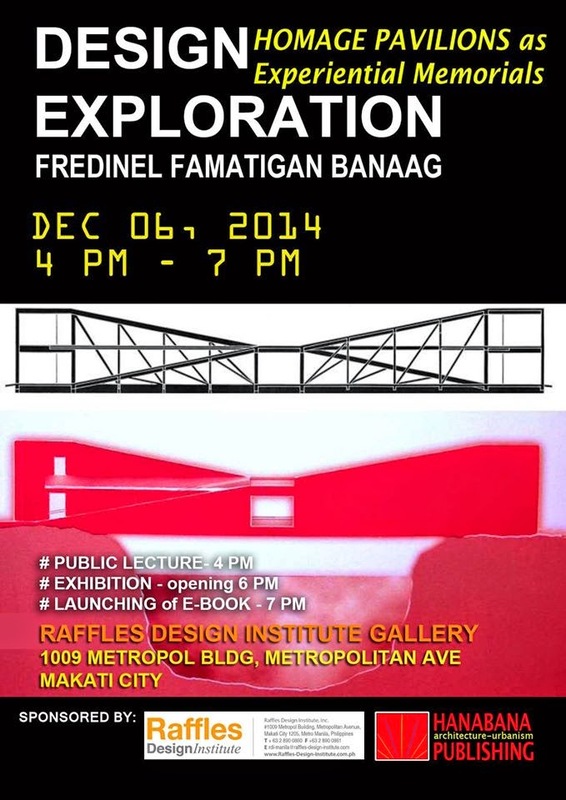 This will be held on December 06, 2014 (Saturday) at 4-7pm at Raffles Design Institute Manila, #1009 Metropol Bldg., Metropolitan Avenue in Makati City. The goal is to explore how a literary work could be employed in the development of conceptual design proposals with the end view of developing forms that could be “freed” from functional obligations towards generating new forms of expression of Philippine architecture. For RSVP, please email rafflesdesigninstitutemanila@gmail.com or contact 890-0860, +63.917.6231538.